Meloetta Pirouette in game: 1,935 Who? Important notice! 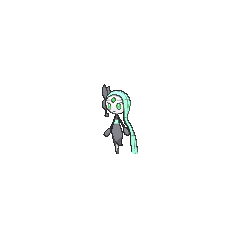 Pokemon Meloetta Pirouette is a fictional character of humans. Meloetta (Japanese: ????? 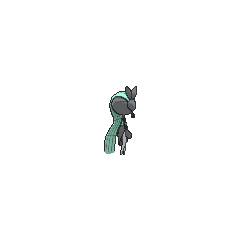 Meloetta) is a dual-type Normal/Psychic Mythical Pokémon introduced in Generation V.
While it is not known to evolve into or from any Pokémon, it has a second Forme activated by using the moveRelic Song in battle. Its original Forme, Aria Forme, will then become the Normal/Fighting-type Pirouette Forme. Meloetta was leaked on a poster of M15 on February 26, 2012, and it was officially revealed by Oha Suta on March 1, 2012. 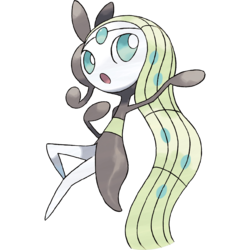 Meloetta seems to be a femininely anthropomorphic figure with musical bar-style streaks in its hair, quarter notes (crotchets) (?) for its arms and hands and pupil-less eyes resembling whole notes (semibreves). It has a jewel on its forehead and a black headpiece that seems to be shaped like a treble clef which doubles as an attached microphone such as one often used by singers. Its ovular head seems to be ? its body's height and about half its height in width. In its Aria Forme, it has light blue eyes and flowing, wavy hair with light-blue ovals that resemble whole notes. In its Pirouette Forme, it has auburn hair that seems to be stylized in a high bun and red eyes. In either Forme, its midriff and eyes match its hair. It is a genderless species. 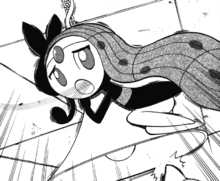 Meloetta made its debut in An Epic Defense Force!. Later, in All for the Love of Meloetta! it appeared in front of Cynthia's car, having been attacked by Team Rocket. It followed Ash, Iris, Cilan, and Cynthia to Undella Town and appeared again in Piplup, Pansage, and a Meeting of the Times!. It openly revealed itself and even sung to the group after becoming very comfortable around Ash and his friends. 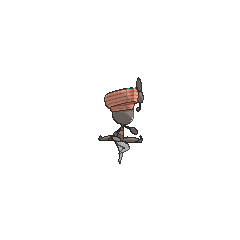 By Meloetta and the Undersea Temple!, Meloetta had become comfortable enough to challenge one of Ash's Pokémon to a battle; however, the battle was interrupted by Ridley who mistakenly believed Ash was attacking it. Giovanni and Team Rocket later forced Meloetta to surrender after threatening Ash and Pikachu. Its final appearance in the season was in Unova's Survival Crisis! when it decided to go home with Ridley. Meloetta in its Aria Forme appears as a Poké Ball summon in the 3DS and Wii U versions of the game. It will compose projectiles that bounce around the stage and reflect off of terrain. It will appear only after playing for at least 8 hours. 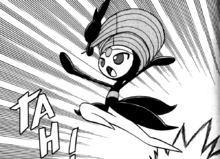 Meloetta is the only Mythical Pokémon that has not appeared in a movie, excluding Phione if it is considered one. Meloetta is the only Pokémon to have more than one unique effort value yield. 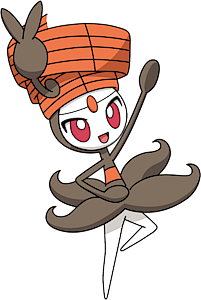 Meloetta's headpiece resembles a stylized treble clef. 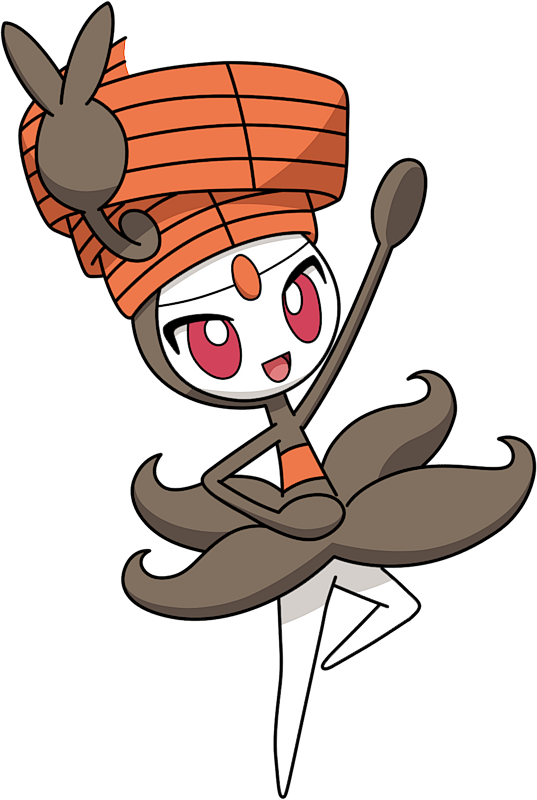 Meloetta's Aria Forme resembles a typical singer with the black headpiece acting like a headset microphone. 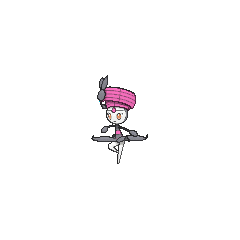 Meloetta may be a combination of melody and pirouette (a type of movement in ballet). Etta is also a common, feminine Italian suffix meaning little and may refer to Meloetta's feminine appearance and diminutive size. Etta could also have derived from the famous jazz singer Etta James.